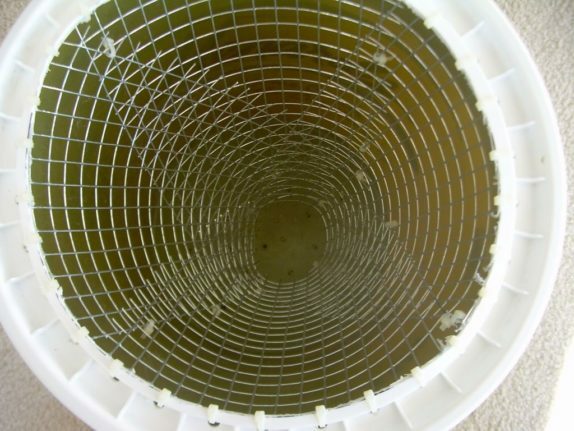 Step one: Drill holes in the bottom of the bucket so that water can flow through, but not big enough for fish to escape. Cut a 9.5″ hole in the top of the bucket’s lid with a cutting wheel and a dremel. After you cut out the hole, attach the lid to the bucket and drill ten holes spread out evenly around the inner perimeter. These holes will then be used to secure hardware cloth to the lid. Step two: Cut the hardware cloth to fit the opening in your lid. If you made a 9.5″ hole, 30″ of cloth should be sufficient. Cut down the cloth between 6 and 12 inches. Now cut across the cloth. Make sure to leave loose barbs attached to the piece you will be using. The side with the loose barbs shall be used for the access hole. Roll the piece up and connect one section using zip ties. Then attach the entire piece to the holes you drilled in the lid, again using zip ties. Step three: To make the hole the fish go through you’ll need to roll the cloth together at the barbed end. It can be tough to do this without some prep work. Cut the cloth down it’s length so there are a total of four sections. After doing this, roll it all together. Secure the pieces and any openings with hardware cloth. Ensure the hole is not too small so that the fish you’re after can’t fit in, but not so big that they could escape. Make sure to cut any wires to make the barbs face the bottom of the bucket. Now, when it comes to using your trap, here are some things to consider. Make sure to choose bait that’ll attract the species of fish you desire to catch. 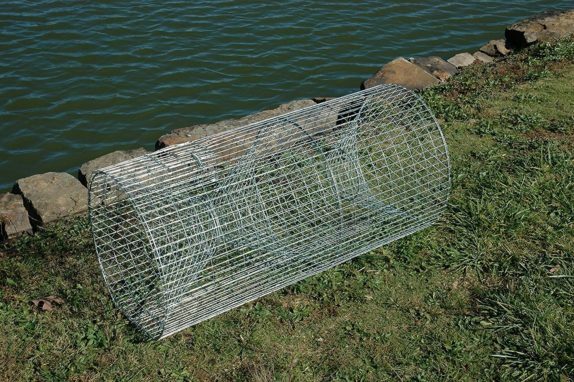 Finally, secure the trap with rope or stones, as you don’t want to lose it. Setting the trap out for a day can be sufficient to catch some catfish. If you find it difficult to get your trap to work, or don’t want to go through the hassle of building one, you can always just buy one off Amazon of course.